Leizhan offers complete coating board paper processing machinery and also replacement components for paper plants. Leizhan stock preparation system and papermaking machinery is specifically developed by skilled technical engineers to realize superb pulp cleanness and high manufacturing efficiency. Leizhan duplex board paper production project can be divided into two part: duplex board paper stock preparation system and duplex board paper manufacturing machinery. According to the manufacturing capacity and recycleables, Leizhan technical engineers made a tailored solution for complete producing project. Machines needed in the duplex/coating board paper pulping solution: ZDSD23 D type hydrapulper, KS dump pulp pump, ZTJ850 pulp chest, KS pulp pump, ZDP450 double disc refiner, KS white water pump, NLSO.6 pressure screen before paper machine. 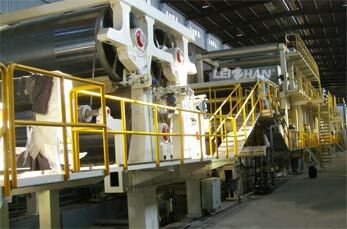 Leizhan coating board paper machinery has a width range of 2400-6600mm and basis weight range of 200-350g/m2. This machine can manufacture 200-1400 t/d coating board paper with the working speed range from 200 m/min to 600 m/min.